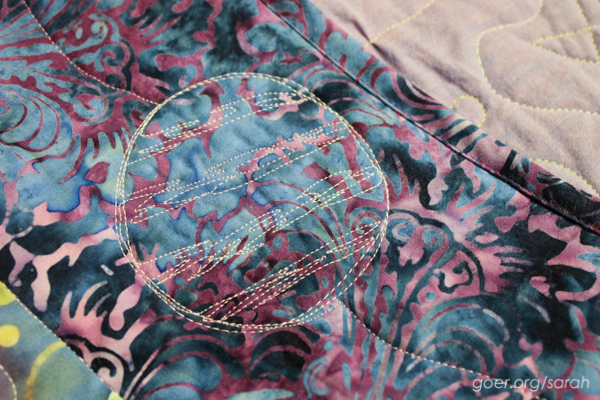 In July, I participated in the Astronomical Quilts! 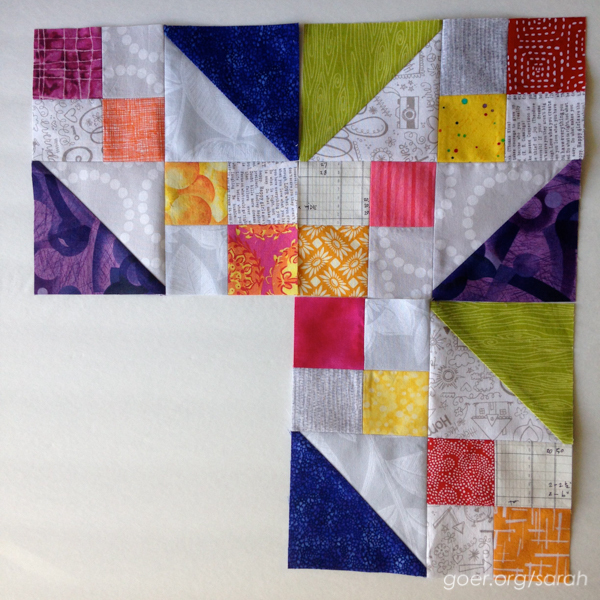 Block Challenge by completing a 9.5" wonky star block. I decided I really liked the block, but didn't want to make a ton of them. 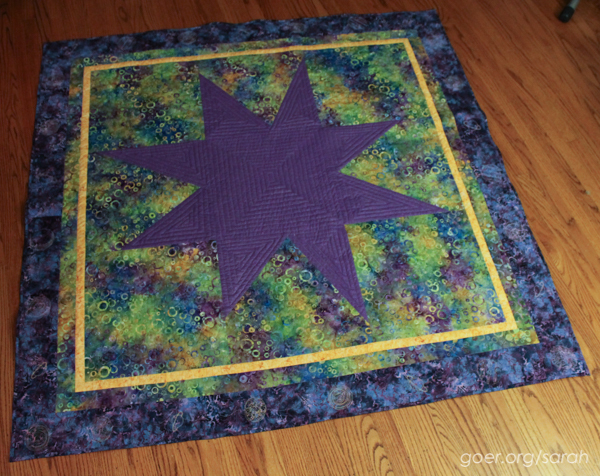 Hence, The Giant Wonky Star quilt (working title). 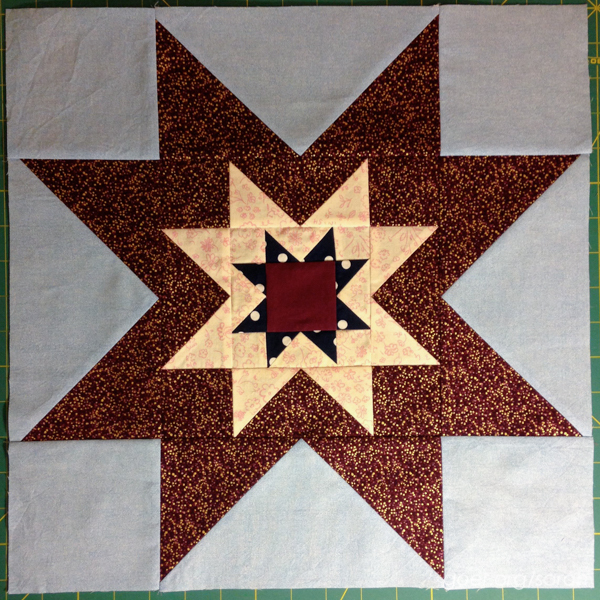 I had enough of the background fabric to make the star 48" x 48". With the three additional borders, it measures 62" x 62". I had the quilt top and pieced back done in August. It went together so quickly. I even made a quilt label for it's September completion. Oops. (I've made a new one.) Thanks again to ALYoF for helping me get a project from the back burner to the finished column this month! 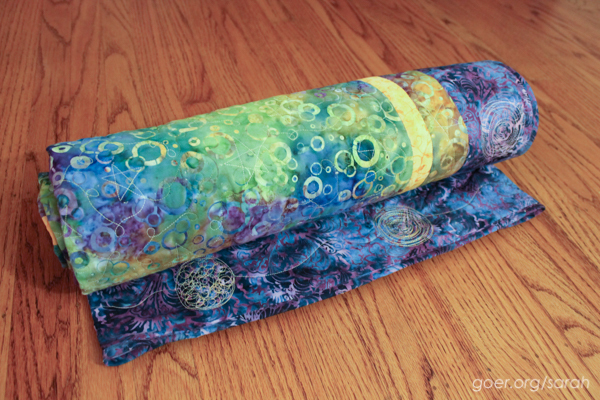 I was searching for a cosmic name for the quilt. With some help from my husband I settled on Stellar Wind. Stellar wind is the flow of particles from the atmosphere of a star, and is not generally symmetric. Perfect! After all those planets, some of them were even kinda round! 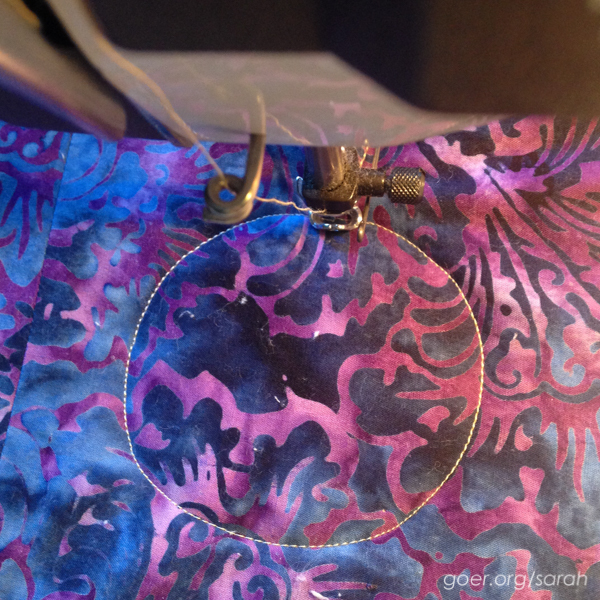 Linking up to ALYoF January Finishes, Finish It Up Friday, & Fabric Frenzy Friday. Posted in Quilting. Tags: ALYoF on January 31, 2015 by sarah. 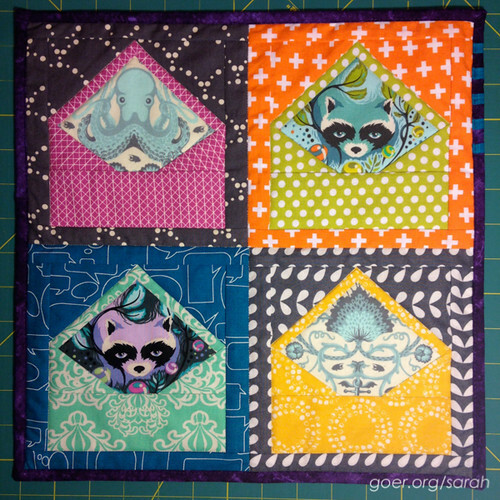 For Stash Bee, Alison asked us to make classic sawtooth blocks with nestled star using her tutorial. I really liked the fast flying geese tutorial that Alison linked to. Her chosen colors were burgundy, light pink, navy and light blue. Light pink is hard to come by in my stash, but I managed to find some good options and I decided to go big with two interior stars. Here's my 16.5" unfinished block. For do. Good Stitches, Lyanna asked us to make three 8 1/2" scrappy Jacob's Ladder blocks with low volume grey background, warm colors in the 4-patches and cool colors in the HSTs. My scraps, precut into 2 1/2" squares and strips, were helpful for the 4-patches. I used some of my leftover strips from last month's do. Good Stitches blocks. 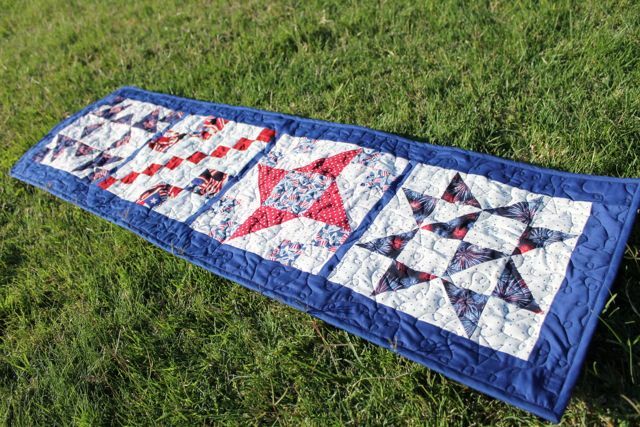 I've realized part of the fun of bees is waiting to see a completed quilt putting together all our work. I can't wait! Posted in Quilting. Tags: bee blocks, do. 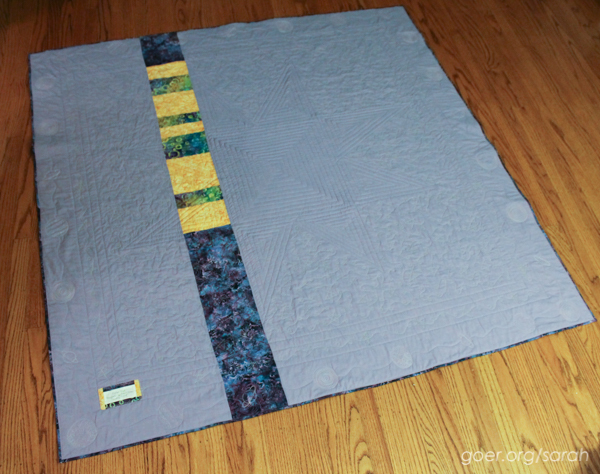 Good Stitches, Stash Bee on January 28, 2015 by sarah. Hello! If you're here for the first time, I'm Sarah. 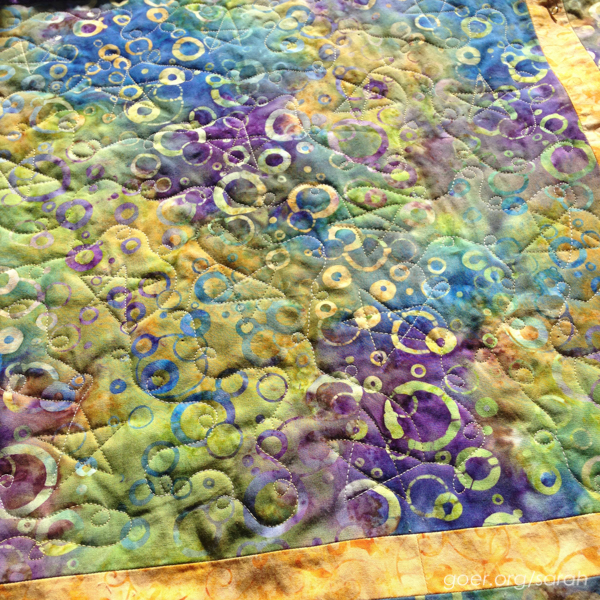 I just celebrated my first blogiversary, I love quilting and I'm totally drawn to bright, bold colors. 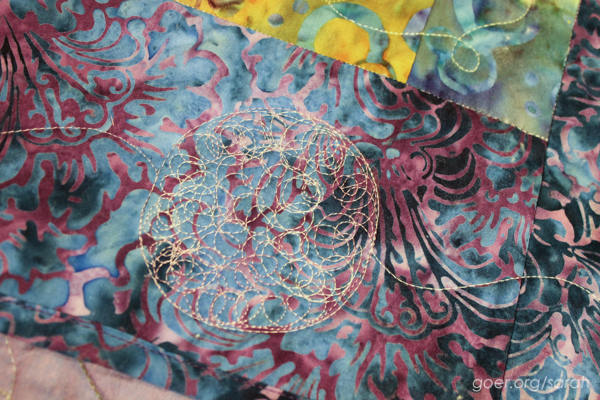 This blog began as a way for me to share my projects, both quilty and otherwise, and has morphed into a primarily quilting and sewing blog. Cookie decorating and other posts are pretty rare now. 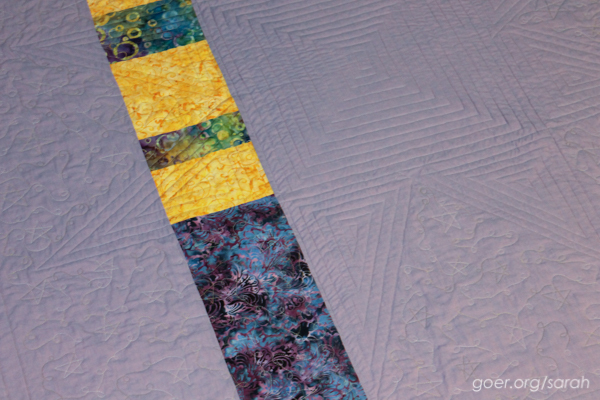 Here are some of my favorite quilt finishes. Candy Shoppe - I'm SO in love with this one. Okay, so it took me ELEVEN years to finish it, but look at all that wonderful color. Go ahead, click through for some awesome closeups that show the details! 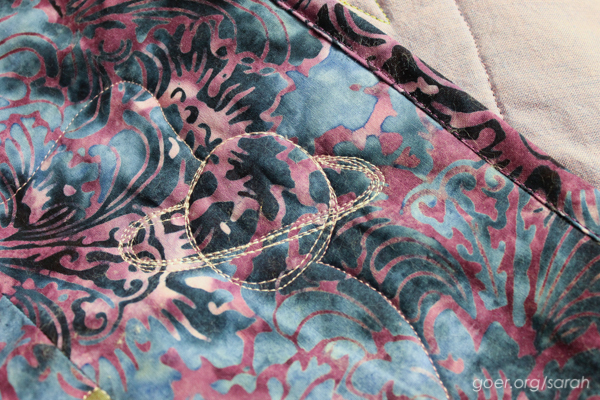 The Purple Quilt - Purple is certainly my favorite color. 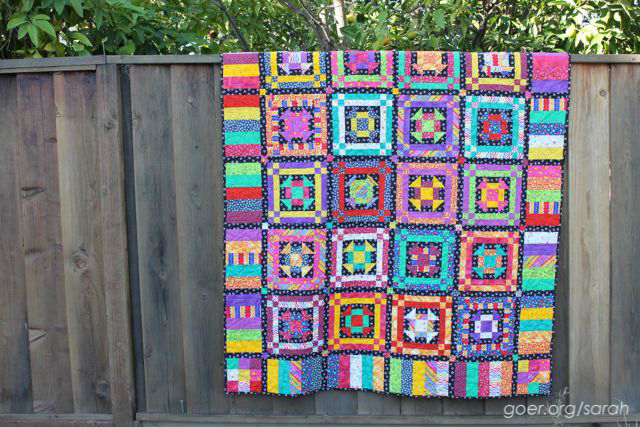 This quilt was the result of a purple fabric swap (how could I pass that up!?) I participated in years ago. 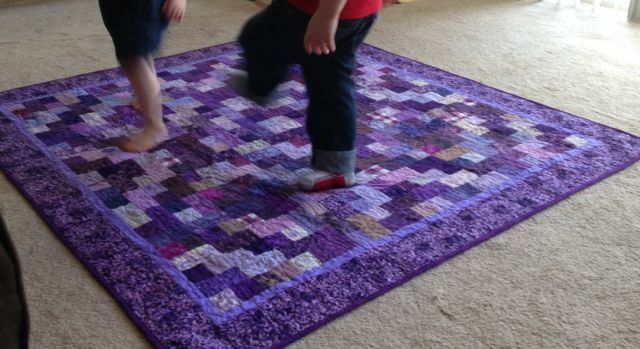 It just makes me smile to see it around the house and I love that my kids enjoy using it as a dance floor. 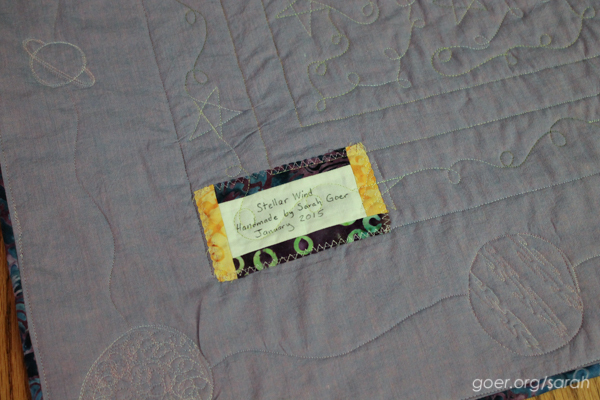 Frieda - While this one isn't actually one of my favorite quilts, the story of why I named a quilt Frieda is still hilarious to me. 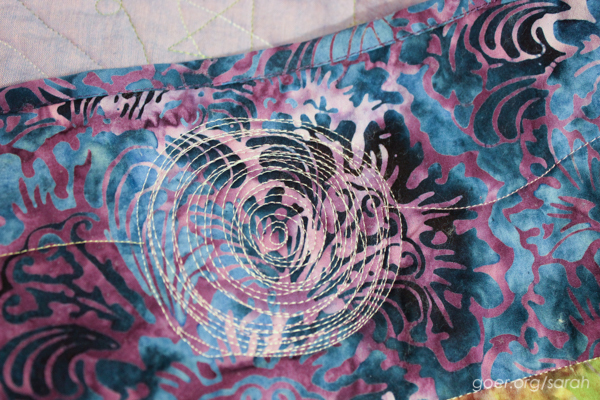 You can see (almost) all of my finished quilts in my gallery. Update: The giveaway has ended. Thanks to Vicki at 2 Bags Full for hosting her 3rd annual Grow Your Blog party. 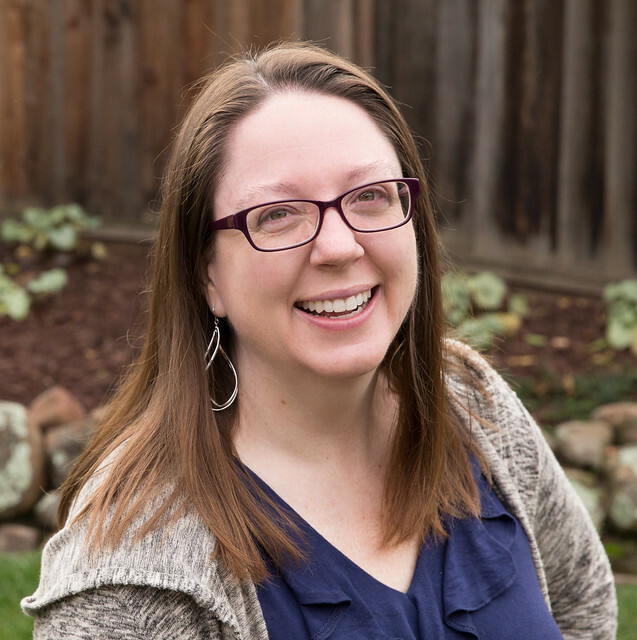 She's organized a list of hundreds of blog participants, so please visit her site to find some great new (to you) blogs to follow. Posted in Quilting. Tags: giveaway on January 25, 2015 by sarah.